Posts will be spare in the next two weeks as I'll be off with the family in Crete, wandering around the ruins of Knossos, contemplating the tides of the Mediterranean, and planning my next piece. BD: Do you have absolute pitch? LH: No. There's no such thing, I regret to tell you. There's habituated or exhausted pitch sense. What they mean is that they've heard those pitches enough so they recognize them. It's actual neural exhaustion. The brain comes up with the idea of, "Well, I've heard that one before," because you hear it enough. BD: But would your re-tuned pianos drive a person with supposed absolute pitch batty? LH: No, no, because it's easy to get new habits. And besides, the ratio, the relationships in equal temperament and particular A440 and all of that... Right now, people are hearing radio tapes that are up a quarter of a tone or down a quarter of a tone and so on. And the symphonic world is going up and the movies are going up whereas the Baroque people are going down. They're already listening to all sorts of pitches. LH: Well, I think that there's no such thing as right or wrong in these instances. What is useful is the general principle that a composer ought to be heard on an instrument that he would have liked in a tuning that he approved. I think that principle's gotten around pretty well now. The Baroque people have done that and, as a result, very few symphony programs anymore begin as they used to when I was growing up with a Bach, a Handel, or Vivaldi, or a Corelli Concerto Grosso. The reason is that big industrial orchestras are really not quite proper for that. BD: Do you use the term "industrial orchestra" in an admiring sense or a derogatory sense? LH: I say that it is an industrial orchestra because there's just no doubt of that. In the last century, the woodwinds were all re-bored by engineers for Equal temperament. The bassoon escaped, by the way, and it can play almost anything as a result. It's an archaic instrument. It's a leftover. And the string section, of course, has also undergone changes. The bridges were raised and the fingerboards bent back for more pizazz. Same thing as the pitch rising. And the trombone is a happily archaic instrument, too, so I always write for that because it can play in tune, you see. BD: So you're very much aware of tuning and temperament and all of this? LH: Oh mercy, yes. I'm a composer. A musician. I'll admit it: I listened to the live broadcast of Das Rheingold; it's the Wagner opera closest to space opera and I'm still waiting for the production that renders it more like a Roger Rabbit cartoon than a LDS temple film (i.e. Cecil B. DeMille without the budget) or Battleship Earth. I'm still waiting. But there was a surprise benefit to staying online with Bayern 4: the next broadcast is (it's still playing right now) Messiaen's Turangalîla-Symphonie (which has some real connections to Wagner of its own, the love theme connects to Tristan and the orchestration at times to the giant music in Rheingold, without which space opera would never exist). 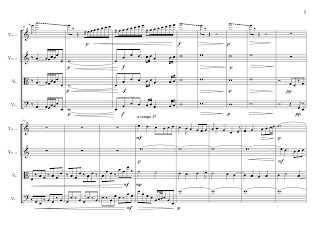 Listening to the Symphonie for the first time in years, it occurs to me that there is an example of might be called an exuberant style of orchestral writing, shared with a band of otherwise oddfellows such as Bernard Hermann, Henry Brant, Claude Vivier, and Magnus Lindberg. Aside from the fact that all of these composers are especially skilled in making scores that can be efficiently rehearsed -- an eminently practical impulse in an environment otherwise filled with abundance -- I don't have any thoughts more profound than that to add. But this: Exuberance makes me nervous. Yes, It's once again time to play Name the Next New Music Box Cover Person. Each month -- as you know too well -- the New Music Box, the internet organ of the American Music Cartel Center features a video interview with a new music personality (and sometimes a small gaggle of them). My guesses have had a bad track record (although my wishes are even further off). Of late, there have been a conductor, members of a new music ensemble, and two composers, one junior, one senior. I predict that the next interviewee will be a critic; it ought to be our senior active critic, Alan Rich (someone, do a serious video interview with Rich now!) but -- it's the AMC, after all -- it's much more likely to be a New Yorker, so I'll guess Alex Ross. What's your best guess -- no NMB insiders allowed -- the winner gets a gift certificate for a Buñueloni at the Cedar Tavern, should it ever reopen. Composing is mostly a solo act and most composers (out of the film business) lack the ego-checks required to collaborate on a score. The most famous co-compositions are probably those pieces left unfinished by one composer and finished by another (Mozart, Beethoven, Mahler, Ives, Berg, Cage) and the younger colleagues who have prepared completed versions are often subject to heavy criticism. There have been a few composers over the centuries -- from Lully to Scelsi -- who have had the means to employ assistants in readying their scores. In some cases, this is unproblematic, with the assistants merely doing the fill-in work in an well-established style, in Lully's case supplying the internal voices (in that beautiful five-part, viola-dominated ensemble texture) to his melody and bass line, but in the case of Scelsi, at least one of the hired-hands protested after Scelsi's passing that he was really the composer, although the scores penned under Scelsi's direction, based on transcriptions of Scelsi's recorded improvisations, and quite closely edited and vetted by Scelsi, sound all the world like something by Scelsi and nothing in the world like the assistant's own music. In other words, the labor might have been shared, but the imagination was Scelsi's own. But co-composition less contentious, indeed jolly, form of co-composition is possible, as well. Cage and Harrison collaborated on the percussion quartet Double Music, agreeing to an ensemble, a number of measure, a metre and a tempo, and then each independently writing two voices, with the two sets of parts later superimposed onto one score (it should be noted that Harrison chose to compose his parts in a version of Cage's "square root" form). The party pieces of Cage, Harrison, Cowell and Thomson followed a surrealist graphic genre, the exquisite corpse, in which one artist draws something, then folds the page, leaving only a few dangling line segments which the next arts continues, blind to the previous image, when he or she then folds over and hands off to the next participant. In these Party Pieces, each composer would write one measure, and a note or two in the next, fold the page and hand it on. Both Cage and Harrison would later go on to further co-compositions -- Cage and Lejaren Hiller (who had himself co-composed the computer-assisted Illiac Suite with Leonard Isaacson) made HPSCHD and Harrison collaborated with Richard Dee on a Concerto for Violin with American Gamelan. I've managed put my own misanthropy aside a few times to collaborate on musical exquisite corpses -- first, many years ago, with Steed Cowart and Jonathan Segel, and later, as part of an "avant garden party" concert by the Santa Cruz New Music Works in honor of Harrison's 80th. The corpses, mostly for an open-score instrumental trio, co-composed with Cowart and Segel were collected under the title The Original Sour Mash, a name which describes both the whimsical atmosphere and the budget potable that accompanied their composition. The later garden variety corpses were done by post and fax and email, a virtual composing party stretching over oceans. I recommend the exquisite corpse as a genre, and as a game for social evenings. It's more fun to collaborate with a group of three or more, and not to keep too strict an row order, so that the pieces don't fall too quickly into a regular back-and-forth rhythm. And these corpses are one occasion in which more rapid and spontaneous composing can be an asset, keeping the spirit light and surprising. The comments to my small notation question -- about use of C and slashed-C time signatures instead of pure-numerical signatures, here -- were very helpful. From now on, I will try to restrict myself to numerical signatures, unless I wish to explicitly invoke an archaic style from some tradition, for example band music (where cut-time, for example, can be an efficient tempo and stylistic indicator) or early music. Scott Spiegelberg made a suggestion about applying tempus and prolation indications to new music; in his Music Primer, Lou Harrison makes the same suggestion, recommending Morley's Plain and Easy Introduction to Practical Music as an introduction to rhythmic modes and noting that early Rock and Roll favored tempus inperfectum, prolation perfect (that is to say, 6/8 time). I'm fond of this compositional idea, but I think that, when all is said and done, especially given the ample musicological experience with ambiguous modal notation, it'll be both more efficient and less ambiguous to notate such relationships with numerical notation. A tangential rhythmic notation question, and one on which I have not been able to get a handle is that of the prevailing counting unit. There was a tendency in the twentieth century to use smaller units (eighths or sixteenths, for example, instead of halves or quarters) and I honestly suspect that this is more for a certain visual appeal -- that obscure aura of notational complexity -- than for facilitating real musical performances. To be fair, I don't have concrete evidence that the smaller units are more or less difficult to read or lead to more or less accurate readings, but I'd just about bet that this is another case of image trumping substance. The Bush administration has claimed an unprecedented level of executive privilege and freedom to operate without oversight. In this, the Republicans in Congress have bent over backwards to enable the administration by either not conducting oversight when in power themselves, or now supporting the White House in blocking effective oversight under the Democratic majority. The administration itself has been so committed to these efforts that they are willing to let major figures (like the Attorney General) appear in public as either liars or incompetents. Given the real possibility, even likelihood, that a Democrat will be occupying the White House in 2009, what could it possibly be which they have hidden which is so potentially damaging to the Republicans if exposed that the Administration and the Republicans in Congress are now willing to cede the same level of privilege to the next Democrat in office? Keep in mind Pynchon's Proverb for Paranoids, number three: "If they can get you asking the wrong questions, they don't have to worry about answers." As long as we're acknowledging our justifiable paranoia, check out this Executive Order. *Terry Riley's term, not mine. Since this is the week that almost everyone is devoting to juvenile fantasy fiction, I decided, being neither a Potterite nor a parent of a Potterite, to read China Miéville's Un Lun Dun. It's a big fun book, full of typical-for-Miéville weird creatures and objects and a few sly takes the tradition of fantasy lit for young people (Through the Looking Glass, without rhymes; a parallel London, akin to Neil Gaiman's Underwhere; and even Norbert Juster's The Phantom Tollbooth done without the didactics). I appreciated his irreverent turns with the obligatory motives -- the odd set of companions out on a quest, the corruption of bureaucratic power, the value of words and books -- and one major plot point in particular, for which Miéville earns some historical materialist brownie points (not surprising, as the author is a trotskyist). One little factoid from my fieldwork in Central Mexico has always haunted me. It was this: that the court poets in the Aztec empire wrote poetry (and, presumably, sung it) in Otomi rather than in their own Nahuatl. The notion that some languages are better for poetry or singing than others is widespread, but it is too east to find extraordinary music in languages supposedly lacking in musical qualities: just take a random poem of Heine or a snippet of a Janacek opera as a counterexample. There are also some near-universal ideas about how languages should be set, not violating stress, tone, or length of natural speech, for example. Aristophanes' complaints about the "new music" of Euripides are an early case in point, but then again, new musics are always finding counterexamples. I'm not exactly sure what Otomi had that Nahuatl lacked in recommending it for poetry -- was it the VOS (verb-object-subject) order? The strong syllabic character (mostly a consonant plus a vowel, without Nahuatl's consonant cluster tl) with regular stress on every other syllable? It's a tonal language (high, low, falling, rising), which may or may not have been useful. My best guess is that it was Otomi's rhythmic effect which recommended it most for poesis, an interesting contrast to the old western prejudices for the simple vowel-rich Latin and Italian. There are an estimated 300,000 Otomi speakers, now. You have to wonder if any of them are active poets or songmakers. Heck, there are an estimated 1.7 million Nahuatl speakers -- are any of them writing or singing in Otomi? Nico Muhly has a fine post about setting texts in and out of your own language in general, and English (the Otomi of our time) in particular. Eszter Hargittai of Crooked Timber has a post about worst jobs. The comment thread is worth a browse for any composer unhappy with their day job, or frustrated by the eyestrain and repetition of composing. I've also gained a new degree of respect for orchestral musicians, especially those in opera pits, in realizing that a number of aspects of their work -- physical discomfort, repetitiveness, physical constraint, close supervision, and heavy personal contact -- are seriously undesirable workplace conditions. How about it - what's your best or worst day job? Sometimes the future comes as ordered, sometimes with delay, sometimes as a complete surprise. When I video conference with an old friend via SightSpeed, he's finally realized one part of the future envisioned during his visit as a seven-year old to the 1964/65 New York World's Fair. But this week, assembling a computer desk with my son, it was abundantly clear that another vision of the future has not yet arrived, that of perfect modularity. Although some of the hardware involved in contemporary assemble-yourself furniture is widely available and interchangeable, there are enough specialized parts for each model of furniture and interconnectivity is still limited to individual manufacturers' product lines or systems that it is still impossible to speak of a practical modularity. As a kid, I was a serious modular artist-in-training, going through sets of Lincoln Logs, Tinkertoys, and Togl, before eventually settling into Lego. (I never did Erector sets, which still strike me as the epitome of a kind of engineering mindset: as far as I can recall the boys with Erector sets would all eventually wear pocket protectors, be able to use a slide rule without consulting the instructions and become Eagle Scouts. They also lived in houses in houses with good lawns, which they mowed without complaint. 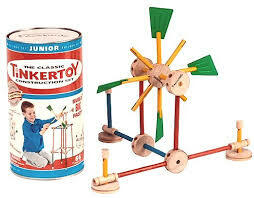 My younger brother Michael was extremely lucky: he had a set of Giant Tinkertoys , the last grand gesture of the toy world in an age still awash in petroleum. Michael still has his Giant Tinkertoys; they are apparently indestructible and should survive any foreseeable earthly catastrophe. When I am lucky, Michael still allows me to play with them as well.) But the Lego set was the most successful modular building set, it was the least constrained by the manufacturer's recommended designs, and as the set was handed down from child to child, it grew with new bricks added in fairly regular intervals, and became increasingly difficult to imagine a design that would be defeated by the bricks combinatorial capacities. My own son was introduced into the Lego world by it's oversized sibling, Duplo, with bricks designed for hands yet to reach optimal motor control, and big enough not to be swallowed often or easily. Unfortunately, as a consumer-parent, I soon discovered that Lego had shifted their business model away from the sets of interchangeable bricks and self-designing, and into a more specialized world, in which sets were sold with precisely the number and shape of bricks required to assemble a specific design -- a building, vehicle, or robot -- and reduced possibilities for creative recombination and reassembly. The dream of modularity is a fixed presence in design industries, but it is truly amazing, a part of the human farce, how ineffective any offered modular system for furnishing or housing has been in being able to establish a wide presence with the long-promised effects of flexibility and economy. The desk my son and I put together in four hours of rather efficiently-used time, had -- aside from the metal hardware -- only a few internally-interchangeable wooden parts, and virtually none that could be used in another piece of furniture. Moreover, the possibilities for reconfiguring the design or connecting it to other pieces were virtually nil. (The chief problem here, to be fair, was not one of design but of cheap materials -- by using particle board laminated only on visible surfaces, the manufacturers saved some money, but lost the inherently flexibility, durability, and recycling capacity of massive wood). The leading commercial enterprise in modular furniture is supposed to be IKEA, but again, IKEA's systems are limited to interchangeability within single system lines, and it is striking both how limited those lines are (shelves, kitchens). It's not even worth talking about modularity in housing -- building a house in traditional Fachwerk-style (or Asian bamboo-based styles) is more modular, flexible, and cost-effective than any industrial style I am aware of. But then again, Fachwerk depends upon complex processes -- like the growth of Willow trees -- that have yet to be duplicated by modern manufacturing. Music has always had some modular aspects. The formulae through which epic songs were sung were modular, and the individual parts in African percussion ensembles have this aspect as well. In Europe an music, counterpoint has a modular aspect (whether modal, or in the fugue, or in Wagner's Netz-technique), as does the entire tradition of rhetorical figuration which reached its apotome in the late baroque. Twelve-tone technique was essentially modular, although the aesthetic goal of most composers tended to be that of keeping the modularity beneath the immediate surface. Many other composers used a kind of sectional modularity, where the "brick" was a stretch of musical material more substantially formed than a pitch set. This is especially evident in music by Satie or in film music. Literal modules of music, to be used like mosaic stones by players in assembling a performance of a work, seem to emerge with Cowell and Milhaud, and became a standard technique in the indeterminant toolbox. Terry Riley has been an effective composer with such modules, particularly in pieces composed for the Kronos Quartet. A modular technique is natural for electronic music -- whether for recorded media (Cage's Williams Mix is a favorite example), or for the instruments themselves (they didn't call them modular synthesizers for nothing), and the use of computer environments in recent years has only made these techniques both more accessible and network-able. (I have previously written of my enthusiasm for the circuit-bending and hardware hacking scene, in which consumer electronics, intended for quite specialized applications, are at once turned into modular goods and are more highly individualized -- while these activities have a long pedigree, the widespread nature and energy of the scene is an entirely new phenomenon). I suppose that music has become more effective than furniture or housing in adopting modular techniques because it has a degree of exemption from certain design criteria that furniture or houses don't have. Sound made be con- or adjoined without the same quality of physical risks that go with a chair, table, or rumpus room. Music might then be considered to have a greater tolerance for structural integrity than architecture or furniture design (musical sounds generally do not run the risk of falling down or apart and causing physical injury), but it is striking how narrowly, in the history of music-making, the accepted limits for music-making, both materially and structurally, have been. The last century has pushed the boundaries of sound design further, and while present musical innovation has concentrated on the more conservative tasks of consolidating and reconciling these innovations, I remain optimistic that there is still plenty of good music to be made on the edge in which sounds and musical stuctures are pushed beyond their design specifications. I have a small notation question -- is there any reason, in a new piece of music, to use a "C" "common time" signature instead of a 4/4 or the slashed-C "cut time" signature instead of a 2/2? In the context of new music scores, in which a wide variety of metres are in play, keeping all of the signatures as numerical fractions seems to make sense. On the other hand, if a piece makes a reference to certain historical styles -- band music, for example -- then the historical notations might be useful contextual referents. Any ideas, opinions? In a previous posting, I attempted a rough definition of musical minimalism* with the aim of recovering the term's utility for a broader swathe of musical activity. This definition can be more or less correctly be construed as opposing those who'd like to restrict minimalism to the activities of a very small group of musicians living long ago in that island kingdom known as lower Manhattan. Without distancing myself from that definition, I'd now like to put it into an even broader music-historical context by attempting to recall the repertoire out of which this music came before the minimal(+/-ist/ism) label was applied. I used to talk about the new eating. One time Terry Riley said, "Yeah, even the cooks'll get rebellious. We'll walk into a hamburger stand and order something to eat. In a few minutes, the cook'll give us some salt. Just salt. Then one of us will say, 'What? Is this all?' And the cook'll answer, 'whatsamatter, don't cha like static eating?" Okay, in 1960, the term minimal (and all its cognates) was not yet in play, in fact, it doesn't enter musical vocabulary for about a decade, quite likely via the visual arts. (In fact, if, in 1960, someone were to start talking about minimalism in music, they might well be talking about Webern, Hauer, or Satie, composers who were unable to use their techniques to create works of traditionally "significant" durations or durations filled with traditional significance.) But over in Berkeley, Young and Riley were playing with the "new eating" and "static eating" as analogies to their musical work, a new music or a static music that is not yet a minimal music. What was that music? Who was making it? What were their shared concerns? The backgrounds of composers in this Bay area scene -- given that we're talking about white American men (and a very few women) -- are musically if not exactly culturally diverse. While studying in conventionally classical curriculae (Young's principal teachers in LA were students of Stravinsky and Schoenberg), both Riley and Young had extensive jazz backgrounds, and so did Steve Reich, Loren Rush, and others. This diversity lead, on the one hand, to a lack of investment in continuity with the European classical tradition, and on the other hand, to an openness to other traditions -- whether it would be Riley or Young studying North Indian music, Reich studying Balinese, Ghanaian, or Jewish sacred music, or Douglas Leedy's engagements with early music or South Indian music. It's not clear that (a broadly construed) concert music is or is going to be the center of their musical concerns. Theatre is one central concern. Young and Riley both had early pieces with theatrical elements, both composed for dance (the extraordinary Anna Halperin) , Young would have early contact to the Fluxus folk, a people not shy of theatre, and Young's own ensemble would eventually carry the name the Theatre of Eternal Music (Richard Kostelanetz's 1968 book, The Theatre of Mixed Means, with a chapter on Young, remains the best contemporary report on the New York developments of this activity). This interest in musical theatre was shared by a number of Bay Area composers: important theatre pieces were composed by Douglas Leedy (Decay), Robert Moran (39 Minutes for 39 Autos), and Ramon Sender (Desert Ambulance). Pauline Oliveros -- not yet the composer of sonic meditations -- was perhaps the best of the Bay Area theatre piece makers, and a number of her pieces must be revived. ** The theatrical activity extended well beyond the bay area. A parallel impulse was at work in the ONCE Festival and Group in Michigan, independently recognizing the theatrical implications of the new music (Robert Ashley's interjection into Roger Reynold's interview with John Cage -- appended to the Peter's catalog of Cage's scores -- is a key moment in this development) and elsewhere, for example in works by Daniel Lentz or Barney Childs. Of course, acting as background radiation to all of this is Cage's collaboration with Cunningham, including the famous Black Mountain happening, which generally require the various artistic disciplines to maintain their own identities, but used music's temporal strengths to organize a common frame. And this application of musical time to non-musical disciplines had a feedback effect, reinvigorating the potential of musical time through the time frames of the theatre, and, ultimately, of real life (recalling, cannily enough, a Borges story, but I digress). An additional concern was music using electronics, a medium without, even now, a fixed place in the concert hall. Broadcasts, recordings, gallery, studio and other non-conventional venues were alternative and alternatively viable environments for performance. The fixed format of music for tape would inspire both the use of live electronics and experiments designed to overcome the rigidity of tape playback (Richard Maxfield was the leading theorist and practitioner here). The studio itself -- the San Francisco Tape Music Center and the Ann Arbor ONCE studio are the models -- was at once a model for working independently of established musical institutions and an inspiring source for investigating and rethinking musical sound. Electronics facilitated Young's notion of getting inside a sound***, through amplification, extended durations, and stable control signals, but also invited a number of other interests, loosely connected to the qualities of mechnization and automation, but also to the entropical tendencies of electronics. Musical processes (looping, gating, filtering etc.) became central interests (the idea of a "systems music" came somewhat later, with systems-oriented groupings in New York (Johnson, Goode, Corner, Benary, Feldman) and England (described in Nyman's Experimental Music)) and a central compositional problem became how best to musically frame and make clear the execution of a process or principle, whether in a phase piece by Reich or in Lucier's I am sitting in a room. May I propose the notion that the impulse underlying all of this activity was, literally, in the classical sense of a turn to roots or foundations, a radical impulse? I won't dwell on the historical coincidence of this artistic radicalism with political radicalism in similar locales (Berkeley, Ann Arbor, NYC) , nor in the recuperation of both these artistic and political impulses into the sleep of the Reagan eras in both California and the US at large, but that's definitely there, too. Instead, I'll just close with the question of renewing the radical moment in music: we have survived Reagan and will survive -- although at great cost -- Bush II, we will also survive Adams and Corigliano and Wuorinen and so on. The question is whether we will find an opening for a radical detournement for our own time. * Minimalism in music is the impulse to articulate or frame a musical work or performance so that the sounds themselves can be clearly perceived as distinct or composite forms and in maximum detail. To achieve this clarity, the number and variety of materials used will usually be limited, and any formal processes used will usually be efficient, evident, and carried out consequently . ** I would be profoundly remiss if I did not note that many of these theatre pieces are profoundly funny works, not funny in the sense of one-off jokes by music majors or Kagel, but gonzo/zen/yoyodyne funny. ***In an early work of Riley's, Young, a small man, was actually required to climb into a grand piano and move about. Thus, Young's physically getting inside an instrument was instrumentalized to allow the listeners to get inside the sound. The current issue of his VOICE, the Czech new music magazine has an article by Petr Bakla about Renewable Music (our new official alias is Obnovitelná hudba) including a number of items translated and, I am sure, some wise and insightful criticism of my projects musical and blogiful. There is nothing more mysterious and flattering than finding your own words translated into a language totally beyond your own sphere of linguistic mastery. Isn't life grand? And, as long as we're at it, should we even wonder why the US -- with roughly 30 times the population of the Czech republic -- cannot support a hard copy new music magazine with the variety and depth of his VOICE? (2) La Monte Young: Studies in the Bowed Disk (1963) for a bowed steel gong (made by the artist Robert Morris). Bowed continuously, the initial impression is of a statistically undifferentiated sound mass. But with extended listening, the perception of details (and they are rich: harmonic, inharmonic, noisy) in the sound of the gong allows the listener the possibility of defining a unique form. (3) David Cope: Endangered Species (2004) for chamber orchestra. Cope writes: "The music of Endangered Species presents unique challenges for listeners. For example, the work is not divided into sections and phrases -- or at least not into easily defined sections and phrases -- as one typically expects of most traditional music. In some ways this makes aural analysis easier, since the music follows a single gesture. In other ways, determining the structure of this work, for example, poses difficult problems. The style -- which I call complex minimalism -- makes the texture at once simple and intricate. These characteristics evoke the notion of minimalism in that material is revealed so slowly that each nuance, every slight change of in pitch, dynamic, and/or timbre, is heightened. The word "complex" comes to mind here because the music gives the impression that it continuous changes, yet never really changes at all. (...) As can be seen [from a score excerpt], the overall musical texture reamins much the same from beat to beat. The entire ensemble plays a majority of the time, with entrances and exits often occuring without metric predictability..."
I've now gone a whole week without buying an iPhone. Several of my more consumer product-oriented composer colleagues have already reported on their experiences with an iPhone, so I thought I'd offer an interim report on my experiences as well. As a musician, I am most concerned with audio quality, and I've been most satisfied in listening to music I've made myself. Of course, opportunities for making music while in transit are somewhat limited; limited in fact to those real sounds I can make with either the sound-making organs of my person and only in those physical spaces where such sound-making is socially tolerated (whistling, walking; cycling, singing; elevator, humming) or those sounds that I make in my head all the time, and disturb none other than me. My play lists, while virtual, have no memory restrictions other than my own, and my ability to shuffle repertoire, as well as manipulate the sound files themselves is virtually unrestricted. Try this one: "me for song a sing Man Tambourine Mr., Hey." In short, the audio quality is fine. I see poorly, so I will not comment on the image making and rendering capacity of my non-iPhone experience, but I believe that I have not suffered any eye-strain due to my non-iPhone use. I'm a fairly big guy, 6'4" and a bit, and then minus a bit for slouching, with fingers designed, via many generations of natural selection, for farming rather than more delicate tasks. I have had no difficulties in not manipulating the small virtual keys on my absent iPhone, a minor triumph of user-interface engineering. I've been very pleased not to have entered into any wireless service contract for an iPhone. I have not been locked into an exclusive contract with a born-again telecommunications behemoth. Billing has been elegantly managed and I have had no problems with waiting on standby for service inquiries. All non-answers to my absent questions about the service have been appropriate, correct, and brief. Not having an iPhone has coincided nicely with the fact that I've had several very pleasant conversations with friends and loved ones, in comfortable and chosen settings. I've even video-chatted with a friend from the comfort of my studio (thus demonstrating that I'm not entirely a luddite). I have not been called in the underground, or on my bike, or while performing ablutions, nor have I called other from any of these environs, thus neither suffering bad connections or potentially embarrassing (if not dangerous) situations. On the whole, a satisfactory experience. Not owning an iPhone has been both a bargain and a pleasure. Indeed, I can even say that since my non-adoption of an iPhone, my sensory and communicative experiences have been enhanced, if only due to the awareness I now bring to those experiences knowing now that I can and, indeed, do have them without either the mediation or cost of an iPhone. Thank you Apple, for enhancing my life. The ANALOG arts ensemble has announced their Iron Composer Omaha competition. The organization has done a great job in setting up this competition in a fair and ethical manner -- the rules are clear, they have done the necessary fund raising to support the competition, and there are no entry fees. Moreover, it looks like it's going to be a blast: by not taking things altogether too seriously, the team at ANALOG may just once more prove that new musicians have more fun. Bravo. Of the mid-century mainstream American composers, Virgil Thomson is the one whose music was the most consistently provocative and to a large extent, the provocation remains, in all senses of the word. Thomson's reputation now is largely based on his work as a critic, and his reputation as a critic was justified: he was always a fun read, chatty, opinionated, clear, but also fond of leaving his most biting judgments between the lines. His two scores to films by Pare Lorenz are fine and have a captive audience in 11th graders learning about the depression in US History classes. His three operas jostle among one another to surface every couple of years, but only Four Saints in Three Acts has ever got the production it ought to have, and even that has faded from living memory. From time to time, one of the pieces will emerge -- most recently it was the 3rd Symphony, a sweet and crazy piece -- and once again, we kick ourselves for having forgotten Mr. T..
Thomson was a unique bridging figure between his establishment contemporaries (Copland, Sessions, Harris, Piston et al) and the more experimental composers (in particular Cowell, Cage, Harrison (with the group of whom he even joined in co-composing a set of "exquisite corpse"-modeled pieces)). But he never exactly fit into either grouping -- although a Harvard man and a student of Boulanger, he was a mid-westerner, and never lost the ability to speak or write in the plain and direct tone of Kansas. A musical Francophile, he was perhaps the first American devotee of Satie but the references in his music were always to middle America, and not approached -- as in the case of Copland, one may well argue -- as material to appropriate, but rather -- like Ives -- as ones own material, with no license required for its use. His connection to Gertrude Stein was a connection to another, earlier avant garde, and also to a uniquely American talent curiously displaced in Paris; Thomson came by his identification with Stein's words honestly and set them entirely in that spirit: loving them, but never bothered by the irrelevant act of pretending to understand them. I am particularly fond of a style of writing about music, and implicitly, a style of music theory, that connects Thomson to Harrison and Cage and back to Cowell and Seeger. It is a descriptive style, focused on the materials, and the task in writing is close to that of composing: trying to clarify relationships among materials, without attempting to attach meanings or values to those relationships. This closeness to composition is important because it is basically an experimental attitude, more in the constructive, "what if" mode than in a platonic mode, dictating from inspiration the reflected sound-image of a musical ideal, or a formalist mode, in which the task is to best use the musical surface to project an abstract underlying structure. (The analogy I've made here to the foundations of mathematics is naive, but honest). Thomson gets closest to the experimental aesthetic in pieces like the early Stein song Susie Asado, with a small set of accompaniment figures applied almost randomly (Thomson frequently used accompaniment figures that became displaced from their melodies -- like the triple metre oom pah pah at the opening of Four Saints in Three Acts), the polytonality of the Sonata de Chiesa, or the Missa pro defunctis, in which sections are based upon a single harmonic idea -- parallel major triads; b5 triads (which are ambiguously heard as inversions of a dominant seventh or subsets of a wholetone scale), parallel major seconds with frequently crossed voices, or an imitation of organ mixtures through massively parallel harmonization. But as experimental as they may get, Thomson seldom risks not making capital-M Music, and when his pieces fall apart, it's not often a falling-apart that creates its own interest. The greater number of his many Portraits -- composed to sitting models: rich, famous, and other objects of his affections -- disappoint, in that judged as Music, they tend not to flow as music, while judged as experiments, they tend to flow too much. Virgil Thomson: almost experimental. I'm at loggerheads about my juvenalia. Should I keep it in my cabinet, or make it public, putting some PDFs online and letting them go out wherever the electron flow takes them? I was not a prodigy, indeed very far from a prodigy, but I did a couple of cool (or at least odd) things as a teenager, and they're a substantial enough part of my musical biography that they still resonate with my current concerns, whether being particular about intonation or being particularly ambiguous about music history. So they're a recording of a search, sometimes stumbling, sometimes sure, to figure out what makes music work and locating the beginnings of possible paths of my own. Of course, the downside risk of this is that maybe I was a more interesting composer at 17 than I am now -- an impossible rivalry - or worse, I haven't made any progress at all. Oh well, sometimes stasis is a form of resistance, too. Enthusiasm is not a substitute for posture. Just when you've convinced yourself that you've tried everything, something surprising comes your way. I was surprised sometime last year to try some guinea pepper (also known as "grains of paradise'), which were important to the medieval European kitchen before being replaced by the indian pepper in each of its hues. Guinea peppers don't have the strength or sustain of the black pepper, but they have hints of ginger and cardamon (the plant is related to both) leaving an entirely different aftertaste. Something lost something gained, I guess, but it's certainly nice that we now have the luxury of both spices on the table; I even have a dedicated pepper mill for the guinea peppers. If that wasn't enough, discovering after 45 years that black pepper wasn't the only partner for salt in half your cooking, a local market here suddenly displayed a rack of native Australian spices, so-called "bush food." An entirely new set of spices have entered my repertoire. Tasmanian pepper berries are again a substitute for black pepper at the table and as a finishing spice, but also for pimento and juniper berries in slow cooking. The initial impact is hotter than black pepper, but the sustain is berry like, with a strong dose of pine and a smaller dose of cloves in the accompanying aroma. Time to buy another pepper mill. The leaves of the Tasmanian pepper plant are also intriguing, perhaps as a sharper substitute for laurel leaves. And then there's wattleseed, somewhere in the taste territory between coffee, walnuts, and chocolate. It's gathered by aboriginal hand from select acacias, surely as exotic as anything I've ever encountered. I've already mastered the wattleseed waffle, and the wattleseed capuccino has a growing reputation. The approach to any new item in the market, kitchen, or restaurant always follows the same pattern. The first stage is settling the question of what the item tastes like, and the only descriptions handy are likenesses. I can imagine, after many years of exposure, that the Guinea pepper will be sufficiently distinguished in my taste imagination from its likenesses, that I start using it as a point of reference in itself. It will be fascinating to see if wattleseeds carve out their own niche in-between nuts and chocolate and coffee. (I've already developed fairly concrete niches for my two favorite Indonesian fruits -- salak and longans -- recently, having my first jicama in years, I was struck by its likeness to salak). The second stage is figuring out how to integrate it into ones diet and cooking repertoire, and this begins with substitutions, which requires a bit of abstract thinking. No longer does one think in terms of black pepper, but rather of pepperiness, and of variations within that field of taste. At a certain point, variations become so distinct that they -- like dialects -- cannot be mistaken for one another. The final stage is, of course, when the taste has become so integrated into the local cuisine that it becomes -- if not ordinary -- then at least, expected. White asparagus in the springtime, cabbage in the fall, and what's this, Mom? Maple wattleseed ice cream again?!!! All of the above could be said for the encounter with a striking new music. Could be, but I'm off to the kitchen. In general, we can assume that the notes on a page, once placed, are going to stay more-or-less in place, but there are examples worth examining in which this is not necessarily the case. It is my understanding that John Kirkpatrick, for many years the person with closest contact to the Charles Ives manuscripts and an authentic transcendentalist, was convinced that, between his visits to the archives, notes would be altered, subtle alterations in pitch or rhythm signaling perhaps that Mr. Ives -- from whatever plane he now occupied -- was not quite finished with his work. It is also my understanding that more recent Ives scholars have not registered such mobility in the manuscripts; I am not certain whether this is to be taken either as an indication of Ives' present satisfaction with the state of affairs, or of a less transcendental approach by more recent scholars. But some more concrete examples, from this plane: There was once something of a fad for mobile scores (a term seized with the joy of recognition by the composer Earle Brown from the visual arts, a term invented by Marcel Duchamp, but associated most with the sculptor Alexander Calder, who distinguished among his own works between those that moved and those that didn't, the stabiles). Stockhausen's Refrain (1959) is the most visually elegant example, in which a plastic strip with notations is fastened to and superimposed over the center of a score for instrumental trio, the central part of which is similarly curved, so that as the strip rotates, the notes upon it, the work's "refrain", are interpolated into the principle score in variable timings. "The Tropical Fish Opera was first performed on the Sonic 1962 series of concerts at the San Francisco Conservatory of Music, the performers being Loren Rush, Pauline Oliveros, Morton Subotnick and myself. Certain areas on the sides of the tank were marked off and whenever a fish swam into that area he or she became a note or a dynamic indication. In this new version, I have prepared a musical staff grid and limited the performers to a mode derived from the I Ching. For enthusiasts of the hexagrams, I used the following correlations: yang=sharp, yin=flat and changing lines are 'naturals.' Thus each of the six lines of the hexagram represents a degree of the scale (excluding the tonic). Subsequent performances of the piece included one on the 1976 San Francisco Chamber Music Society concert series under the direction of Robert Hughes." Robert Moran arranged or took part in several further performances of the Tropical Fish Opera, and composed a work of his own, which might well be thought of a companion piece to the Sender. Moran's DIVERTISSEMENT NUMBER ONE, for electric frying pan and any variable ensemble was premiered in San Francisco in October, 1967, by the New Music Ensemble of the San Francisco Conservatory of Music. This, like the Sender score, involves mobile notes, which are interpreted against the grid of staves which are marked on large sunglasses worn by the players. Fish are not present in the Moran score, but their function is taken by popping corn, which add a percussive accompaniment also not present in the Sender. 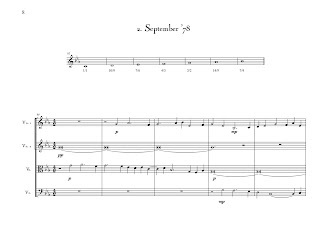 The third work in this minor genre is by John Steinmetz, a composer and virtuoso bassoonist. Steinmetz's Fish Phase (1975) again required an aquarium with staves notated on the glass, but its subtle fixed orchestration for two contrabassoons distinguishes it clearly from the Sender, moreover the title suggests a connection -- also a west coast connection via Steinmetz's teacher Subotnick to the early sixties Bay area experimental music scene -- to the phase-based works of Steve Reich. Nowadays, with computer technology and, in particular, game technology, it is relatively easy to create notational environments in which mobile notes are present. The motions of notes and the irinterpretations can be as loosely or tightly controlled as one wishes, and the possible strategies are manifold -- from games to contingent situations, like the three west coast pieces described above. My impression is that David Behrman is probably the pioneer in this field, but I have not followed it as closely as I might have, just too damn busy watching the fish go by, I guess. First suggestion: remember that the music of the students, acolytes, and camp followers of Babbitt, Boulez, or Carter is not to be equated with the music of Boubitt, Babter, or Carlez. Imitation is flattery, and flatterers are seldom worth listening to. Originals in music, on the other hand, like originals in sin, are usually worth experiencing at least once, and each of these three has legitimate, if modest, claim to originality. Second suggestion: remember that, although honored and ancient now, Bablez, Carbitt, and Bouter were all once young, unknown, and prone to risk-taking. Under the influence of Iwan Wyschnegradsky, Coulez once had a romance with microtonality (although the marriage failed), he once called Cage his friend, and in some works (especially the mysterious, withdrawn, Polyphonie X) pushed a program that can only be considered experimental before withdrawing into the security of traditional performance practice. Cabbitt tried his hand at Broadway, admitted that microtones were possible on the merry old RCA Synthesizer, and still likes beer and baseball, suggesting a youth that has not yet waned. For all his tenure-insuring talk about 12-tone technique, in the end, his music is about improvising out, on paper, from a recycled set of arrays and superarrays that he never bothers inventing new these days. (You'd grow tired of musical Sudoku, too). And Barter, has never committed the venal sin of promoting a particular method of composition, and has been as interested in timbre, rhythm, and metre as in collections of pitches, and when then, sometimes even reducing the number of pitches in play to but one. No, I'm not calling him a minimalist (the Purcell of the Fantazia On Upon One Note was not a minimalist) just more interesting than the official party portrait. Finally, do not fear the music-political machinations of these three for they are old, each of them, and in their glorious good health do they take retreat from their previous seats of power and influence. If you have personally suffered injury at the hands of any of these three, TTibbab, Retrac, or Zeluob, whether as teachers, jurists, or bureaucrats, then learn the lesson well not to put people of such different character in the way of your work, your music, your life. In Newmusicstan, we're not even two bloody countries fighting over bloody nothing, we're just musicians doing the best we can and surviving on crumbs. So, if you encounter someone in our little republic who's looking to grab some power, gently remind him of our trio of terror, now reduced to docile harmless gentility, and the fact that every composer, of whatever talent, taste, or background, is equal in at least one regard. And that is the right to be heard and forgotten with the rest. Belize or Peru? Ambit blob tint. A trill to erect! No Brit not bit by lamb. Alert lice trot! Pure bile: zero. Once more about Sibelius and Ross: Adam Baratz has a great follow-up item here, in which he questions the drive for innovation. I have to disagree with Adam, as I believe that innovation is important, but with the caveat that innovation does not necessarily form a single narrative inscribed along a single dimension of music -- it's not just about pitch usage, or rhythmic practice, or complexity in one parameter or another, it's about a polyphony of narratives, without a rigid arrow of development or evolution, and always in reserve is the potential to respond to increases in complexity with radical re-beginnings which may be materially spare but are never simple states of affairs. Music history is usually written in terms of big ideas and their repercussions, their wake. So if one decides on an alternative set of big ideas, the wake starts to sound substantially different. William Austin's history began with Debussy (so, too, did Heinz-Klaus Metzger and Rainer Riehn's MusicTexte series), and others focus on the Schoenberg-Stravinsky divide, or its larger analog in German/French traditions. There are also schemes based upon European/American or classical/vernacular distinctions. But what exactly happens if we put a Sibelius or a Skryabin or an Ives in the center? With a Sibelius in the center, the music of a composer like Hovhaness begins to take on a completely different profile, and the supposed naivete of Hovhaness's modal practice and loose counterpoint doesn't seem so naive anymore. Likewise with Skryabin, it's impossible not to immediately call up Messiaen in his wake, and the music of a Boulez (connected to Skryabin via both Messiaen and Wyschnegradsky) can be heard in a surprising and revealing context. By changing the point of departure, we pay attention to a different landscape, and end up in other places. Alex Ross has a fine article about Sibelius, a chapter from his long-awaited book on 20th century music. Among many other things, it's a reminder that for a good part of that century, Sibelius was both a preeminent and popular musical figure, and that the sophistication of his music was often came to be lost on musical professionals, composers, and academics, for whom the essential figures at mid-century, Schoenberg and Stravinsky, became the central actors in the established narrative, often overlooking* other important streams. We are just now beginning the process of resorting out our reception of 20th century music, with a process of recuperating and reassessing many legacies: Mahler and Ives have been now recovered, Strauss and Ravel have received a more differentiated appreciation, the cultural and intellectual complexity underlying works of Debussy, Puccini or Bartok has become more clear and we may yet hear the same for the Skryabinistes, or for figures with careers somewhat lost to complicated times, from Prokofiev to Resphighi. My grandparents -- born and raised in or near Paso Robles, California in 1909 -- both shared the opinion that Sibelius was their favorite composer, the tone poems Valse Triste and Finlandia -- warhorses of the time -- in particular. Classical music was not unknown in Paso Robles -- Paderewski was a regular visitor to the hot water spa there, and my Grandmother heard him practice, and one time evn got to play the composer/pianist/politician's famous Minuet for him -- but music in Paso Robles was not orchestral, and for my grandparents, not yet recorded or broadcast. They heard Sibelius's orchestral music as piano music, in transcriptions for two- or four-hands, so they were hearing the music stripped of a dimension we now assume to be essential to Sibelius's musical identity. Ross writes well of Sibelius's thematic invention, but only touches on the complexity of Sibelius's harmonic language, and I can only describe it this way: at any given moment, the expectation of what should or will happen next is almost aways defeated and the listener is almost always overwhelmed by surprise. * Why does "overhearing" not have a parallel meaning with "overlooking"? Our language sometimes has a real bias towards the visual. In his landmark Treatise on Orchestration (1935-43, in four volumes; the lack of an English tradition is a loss, likewise the lack of a translation of Hans Kunitz's 13(!) volume Die Instrumentation)), Charles Koechlin devotes a section to the modern chamber orchestra, with Schoenberg's (first) Chamber Symphony getting its due regard, but not without first discussing Milhaud's Little Symphonies, which both because of and in spite of their modest scale and unusual instrumentation, constitute a far more fundamental challenge to the symphonic tradition than Schoenberg's, which, after all, accomplishes essentially everything that had become necessary for a Symphony to do, even in the non-stop (one can't quite say "one movement") form and condensed orchestration. * Milhaud, in contrast, jetisons all that had attached itself, like barnicles, to the symphonic genre and, at once, jumps back to baroque origins, prior to establishment of the tonal expectations which would come to underly the sonata function, while at the same time pushing tonality in a direction implied by contrapuntal thinking, but decidedly unhistorical, and that is parallel- or polytonality; prior to the establishment of the "standard" orchestral ensemble (these instruments, in these sizes, in these groups, in these numbers); and prior to the generous time scale of a tradition infected with the masterpiece ethic. That said, these little symphonies are both strange and delightful, a reminder that at any moment in music history there is always an alternative path. * In his own writings on polytonality, Milhaud drew his own contrast to his Viennese contemporaries, hearing their music as inheriting and continuing the Wagnerian chromatic tradition while his own music represented a continuity with French diatonic and modal traditions, a polemic no doubt containing a nationalistic aspect, perhaps in parallel to Schoenberg's own interest in demonstrating that his techniques could insure the hegemony of his own national music. When the definitive history of late 20th century music gets written, there are a few royalty-driven factors which have contributed to musical practice that ought to be noted. The following are based upon my experience of German institutions (GEMA, radio stations), but will be more-or-less true in several other countries. The first have to do with duration: anything 10 minutes or less in length will be paid poorly, and a duration of slightly more than ten or twenty minutes is probably optimal, pushing the piece into the next compensation bracket (a nine minute or nineteen minute piece, representing only slightly less labor, is stuck in the lower bracket). There is a lot of pressure out there to make twenty minute pieces; to the best of my knowledge, there are no artistic arguments for a twenty-minute piece being intrinsically better or more more significant than a twelve minute piece. At the other end of the duration scale, pieces that don't fit easily in a broadcast schedule -- allowing time for station i.d. 's, top of the hour news, program notes, or commentary -- will be less likely to get broadcast, and the same is true for pieces with extended silences, as some national radio regulations forbid extended "blank" airtime. Another consideration has to do with electro-acoustic music: a piece for recorded media is paid very poorly, but if the piece "requires" a live performer for its broadcast or concert playback, the use of live mixing, for example, can elevate the work out of the recorded media category and it will be better compensated as a concert work. So if you encounter any of those famous photos of Stockhausen or Nono facing a mixing board, looking very stern, they may well be adding monetary value to their pieces. Finally, a reminder that no composer or publisher outside of the mass sales of the band and choir worlds makes significant money from sheet music sales. Sheet music is a vehicle for obtaining performances, recordings, and broadcasts. No royalties are collected by rights organizations for sheet music sales which are a private arrangement between a composer and a publisher. A publisher makes money from their share of royalties and, for larger pieces, from score and part rentals. Publishers can help with handling sheet music and parts, and should help with promotion, but every composer should calculate very carefully whether the cost of sharing royalties (usually 50-50) with a publisher will even potentially be matched by benefits. The presence of new music on the web is still being sorted out, but it looks more and more clear that placing perusal scores online is beneficial, actually generating interest and performances, while the compensation for online recordings or performances remains unsettled. As a composer who depends upon royalty income from live performances, I have decided that to place scores online but for the time being will not upload recordings. (I've toyed with the idea of discouraging -- if not exactly forbidding -- the recording of my scored pieces intended for live performance but that's a subject for another day).